Over 20 years ago, when she was new to the world of teaching preschoolers, Peggy Martalock got her hands on a copy of The Hundred Languages of Children. Still in print today, the academic tome offers a comprehensive look at the theory and practice behind an Italian teaching philosophy that has become recognized and acclaimed as one of the best systems of education in the world. Not long afterwards, Martalock was running a licensed family daycare center, caring for toddlers and preschoolers near her home in rural Wisconsin. She picked the book up and read it again. “I just went, ‘Wow.’ It shifted my perspective. Embracing the Reggio Emilia approach changed everything for Martalock—from the way she educated children in her care back then to the way she works with GCC students now. It shaped her own studies in master’s and doctoral programs, and it’s allowed Martalock to become a thought leader for educators in this region as well as in eastern Massachusetts. Martalock has led several conferences for educators locally on the approach, as well as in the Boston area in the late summer, when she presented to roughly 125 educators from across the state and beyond. She will again present “Wonder of Learning 101: Introduction and Experiences with the Reggio Emilia Approach” at the Williston Northampton School in Easthampton on Sept. 19 and 26 and Oct. 3. 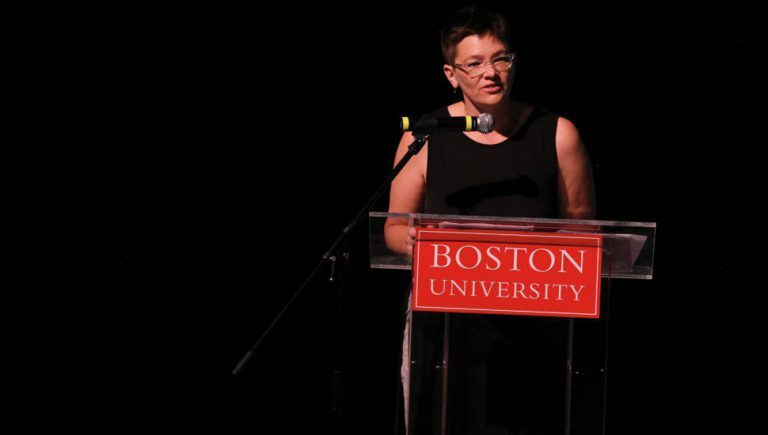 In addition, Martalock is the only educator from Western Massachusetts to have a role in helping regional educators access The Wonder of Learning Boston 2018—an exhibit that travels internationally and is now on view through November at Boston University’s Wheelock College of Education and Human Development. Martalock has had a role as well in planning related, ongoing workshops, hands-on learning opportunities and policy discussions in the Boston area. Reggio Emilia is an early education approach based on principles developed in the 1940s in the Italian city of Reggio Emilia. It’s now considered by educators to be one of the best systems in the world for teaching children under 5 the principles of curiosity, interaction, problem-solving, and experiential learning. At GCC, Martalock teaches on the approach in courses for early education students, and she also offers the workshops to students and members of the wider community, which allows GCC to engage in a broad way. Martalock is in her fifth year at GCC. She holds a bachelor’s degree in art history from the University of Wisconsin, Madison; a master’s degree in early childhood education from the University of Wisconsin, LaCrosse; and a doctoral degree in teacher education and curriculum studies from the University of Massachusetts, Amherst. She has worked at a preschool in Wisconsin—which, incidentally, will host the traveling Wonder of Learning exhibit in the spring—and has also taught at the Smith College Center for Early Childhood Education at Fort Hill. It was at her licensed family daycare many years ago, though, that Martalock first put the Reggio Emilia approach into practice. She had just read the book on the philosophy for the second time and was inspired to experiment. She had eight children under 5 years old in her care then. Martalock gave them each a pen and a clipboard—actual, adult “tools,” instead of a medium “for children,” like finger paint—and she took them outside. Rather than tell the youngsters to draw the dandelions, she invited them to pick one and study it. “They had the sense we were doing something cool,” Martalock said, noting that she then asked the children to draw what they saw in their flower. When the drawings were complete, instead of telling the children she liked their artwork, Martalock initiated a discussion. “Tell me what you see?” she asked them. A conversation about one child’s stem led to Martalock’s question, “Show me the stem. In addition to explicitly teaching sections of education courses on the Reggio Emilia approach, Martalock also uses the method in her own teaching approach in the classroom at GCC. In the lab, students also have an opportunity to play and learn with the materials in a preschool classroom—everything from art supplies to an easel and a light table, on which, students can examine just about any kind of material to explore science in a unique way. As one of the educators who helped to plan and execute The Wonder of Learning Boston 2018, Martalock knows that one goal is to draw educators from across the state—all zip codes. So, she is excited that GCC is supporting her in taking a busload of nearly 60 students and community members to visit the exhibit on Oct. 20. Martalock and her colleagues in the Education Department are planning a pre-trip “soiree” on Oct. 11 from 5:30 to 7 p.m. in the GCC library solarium so that participants—and anyone interested in the Reggio Emilia philosophy on its own—can meet, mingle. Those traveling to the exhibit can also talk about what to expect from the experience. Martalock notes the evening will allow students to develop relationships with professional educators in the region—relationships that could develop into future opportunities, such as internships. She hopes the field trip itself will allow students to see themselves as future educators.